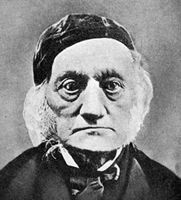 Owen (July 20, 1804 – Dec. 18, 1892) was an English anatomist and paleontologist who is remembered for his contributions to the study of fossil animals and for his strong opposition to the views of Charles Darwin. He coined the word "Dinosaur" meaning "terrible reptile" (1842). Owen synthesized French anatomical work, especially from Cuvier and Geoffroy, with German transcendental anatomy. He gave us many of the terms still used today in anatomy and evolutionary biology, including "homology". In 1856, he was appointed Superintendent of the British Museum (Natural History).